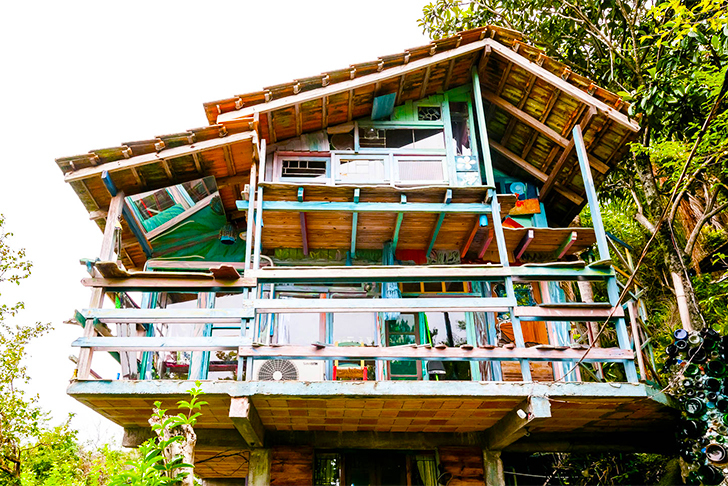 Perched atop a hill in the paradisiacal island of Florianopolis, Brazil, there is a colorful home made entirely from scrap. 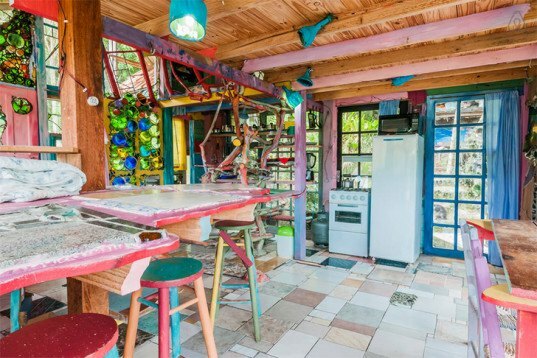 Dubbed 'Cabana Floripa', it was built by a Uruguayan visual artist names Jaime from demolished houses. The resourceful Latino said he started building it by intuition and to give a new life to old wood, glass bottles, ceramic tiles, broken mirrors and other 'garbage' he found. The Floripa cabin is located on the north of the island, overlooking rough but crystal clear waters and a fine white sand beach. Jaime settled in the island 30 years ago, where he decided to base his visual arts studio, and later on, built his recycled cabin. Nowadays he rents it on AirBNB offering the perfect, eco-friendly spot for a family to enjoy. ‘Cabana Floripa’ has a double and a single bed on the lower level, and an extra double bed up in the loft. It’s equipped with air conditioning (an essential during Brazilian summers), a TV, internet access, a comfortable kitchen and a bathroom. The Floripa cabin is located on the north of the island, overlooking rough but crystal clear waters and a fine white sand beach. Jaime settled in the island 30 years ago, where he decided to base his visual arts studio, and later on, built his recycled cabin. Nowadays he rents it out through AirBNB, offering the perfect, eco-friendly spot for a family to enjoy. 'Cabana Floripa' has a double and a single bed on the lower level, and an extra double bed up in the loft. It's equipped with air conditioning (an essential during Brazilian summers), a TV, internet access, a comfortable kitchen and a bathroom.